The battle of Cerro Corá was fought on 1 March 1870 on a hill-surrounded valley of the same name, in the north-east of Paraguay. This was the last battle in the War of the Triple Alliance. 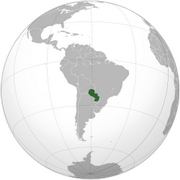 The Chaco War (1932–1935) was fought between Bolivia and Paraguay over control of the northern part of the Gran Chaco region (the Chaco Boreal) of South America, which was incorrectly thought to be rich in oil. It is also known as La Guerra de la Sed or "War of Thirst". It was the bloodiest military conflict fought in South America during the 20th century. Asunción (full name: La Muy Noble y Leal Ciudad de Nuestra Señora Santa María de la Asunción; Guaraní: Paraguay) is the capital and largest city of Paraguay. The Spanish word asunción means assumption in English. It refers to the Assumption of Mary; the full name means The Very Noble and Loyal City of Our Lady Saint Mary of the Assumption. The "Ciudad de Asunción" is an autonomous capital district not part of any department. The metropolitan area, called Gran Asunción, includes the cities of San Lorenzo, Fernando de la Mora, Lambaré, Luque, Mariano Roque Alonso, Ñemby, San Antonio, Limpio, Capiatá and Villa Elisa, which are part of the Central Department. The site of the city may have been first visited by Spanish conqueror Juan de Ayolas, on his way north, up the Paraguay River, looking for a passage to the mines of Alto Perú (present-day Bolivia). Later, Juan de Salazar y Espinosa and Gonzalo de Mendoza, relative of Pedro de Mendoza, were sent in search of Ayolas, but were unable to find him. On his way up and then down the river, de Salazar stopped briefly at a bay in the left bank to resupply his ships. He found the natives friendly, and decided to found a fort there, in August, 1537. As customary, he named it according to the religious feast of that day: for August 15, Nuestra Señora de la Asunción (Our Lady of the Assumption), honoring the feast day of the Assumption.